Or Contact Us Online and we'll respond quickly. H2o Labs, Ltd. is an EU based company with order fulfillment services in the United Kingdom. Durastill 46 Litres Per Day, Automatic Water Distiller with 40 Litre Reserve tank. Also has casters and level gauge. Connects easily to any source water line for automatic filling. Automatically turns on and off to replenish reserve tank as necessary. Made in USA. Produces 46 liters (approximately 12 gallons) every 24 hours. Built-in connection for adding remote faucet system to provide distilled water throughout the house. Self-Sterilization Feature. With empty reserve tank, simply flip fan switch off for a couple minutes when steaming. 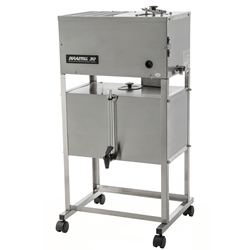 Overall Height: (Water Distiller plus Storage Tank) 107 cm- Allow 8 cm additional for ventilation, 115 cm min. total. © 2016 H2oLabs - Reproduction or duplication without written consent is prohibited.